Are all executives unethical? This White Paper argues that, absent objective evidence, it’s simply unethical for executives to believe that product and software development in their organisations is reasonably effective. London, April 11, 1876. There is uproar in the House. But this is not the House of Commons, rather the Grosvenor Hotel, and the furore is not political but – more unusually perhaps – philosophical. William Kingdon Clifford – then professor of mathematics and mechanics at University College London – and the youngest ever person to be accepted into London’s elite Metaphysical Society, is presenting his inaugural paper. His audience includes the likes of Alfred Tennyson, William Gladstone, Thomas Huxley and the cream of London’s intelligentsia. The title of his paper is “The Ethics of Belief”. Even before he finishes his reading, half the audience have stormed out of the room in protest. The remainder are on their feet, heartily engaged either in shouting him down or cheering him on. What did the audience find so contentious about Clifford’s proposition? In his essay, he asserts that whatever someone chooses to believe cannot be exempt from the ethical judgement of others. A belief may leave someone open to a charge of unethical behaviour, depending on whether they have earned “the right to believe it”. London, October 2008. Waves of financial crises crash upon the bulwarks of the World’s financial system. Ordinary people in all walks of life look upon the excesses of business in a new, and distinctly unflattering light. What has happened to the traditional business values of probity, social responsibility, ethics? Good questions indeed. Management – and especially financial management – has become tarnished. Executives are regarded with suspicion, even contempt. Of course, recent events have only served to propel these issues into the public eye. In many avenues of management – and over many years – complacency, self-interest and greed seem to have overturned diligence, responsibility and probity. I believe we could all benefit from taking a long hard look at what we have become. My own focus of concern is the arena of software and product development. I have seen literally hundreds of organisations in the business of developing software-intensive products and services in the course of my career. Most of these businesses have been wasting enormous amounts of time, money, effort, and human potential, through their unwittingly inefficient approaches to the practice of software development. And in most cases, little or nothing of any effective, practical value is done to address the situation, or if done, then not sustained. In my experience this almost always comes about because those nominally responsible for the situation – the senior executives of a company – honestly believe that their software development people are doing the best they possibly can (even though that rarely seems good enough). Do executives have the right to believe that their people are working as productively as possible – even if they have not gathered and considered the evidence? But what if disaster (or merely loss of profit) does not befall the business? Would the executive be any less guilty? Prior to Clifford, the established intelligentsia presumed that beliefs could never be examined in an ethical light. A gentleman could believe any damn thing he pleased. Until recently, it seemed as if that presumption still held sway in many organisations (including HM Government). But today, William Clifford’s question comes back to haunt us. Yes, executives may truly believe that people are being as productive as possible – but do they have any right to believe it? My name is Bob Marshall and I’ve been a specialist in the transformation of organisational performance – particularly in the software development and business technology arenas – for the past twenty years or more. I became a “Rightshifter” in the first place because of the egregious waste of time, money, effort and – above all – human potential that I saw time and again in organisations trying to develop software-intensive systems and products. So many people have such a poor time at work, frustrated and unfulfilled every day, in the majority of left-shifted organisations out there. And the main reason for all this misery and waste? A simple belief that things are OK. Or at least, not amenable to improvement. Such a belief seems widespread, particularly amongst senior executives. So, before I make the case for Rightshifting as an ethical and moral imperative, allow me to describe in a little more detail just what I mean by “Rightshifting”. Nowadays, the profitability – even the very survival – of most organisations relies on the ability to consistently produce (or acquire) software-intensive technology at an economic cost, and then integrate that technology into their lines of business (LOB). Yet few organisations ever give much thought to building and growing their ability to do so. Note: Although this chart is essentially anecdotal in its representation of organisational effectiveness, there’s much empirical data from e.g. ISBGS showing a very similar curve for individual projects. By “Rightshifting”, we’re talking about the process of moving organisations to the right along the horizontal axis of this chart. 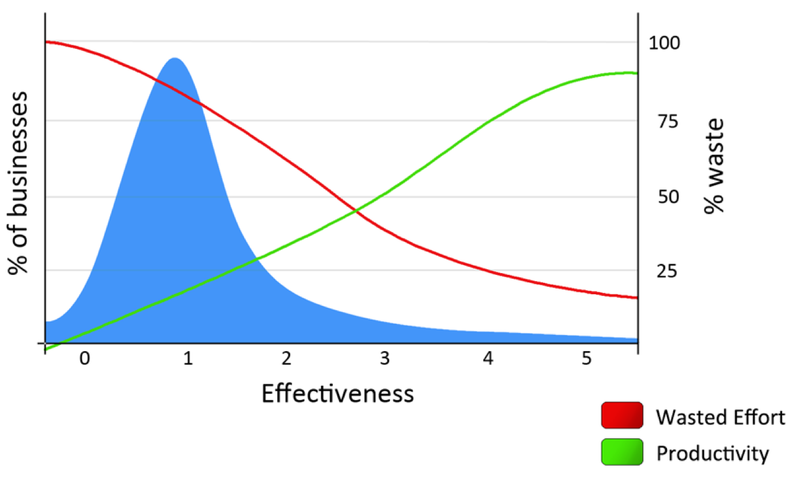 Most people don’t expect organisational effectiveness to be so unevenly distributed – with such a disproportionately high number of relatively ineffective organisations. This distribution suggests that most software personnel have never seen software development at its best (or even, good). Their unfamiliarity with effective practice gives rise to a natural scepticism about whether things are really any better anywhere. Even people who have worked in the software industry for twenty or thirty years might never have seen software development practices anywhere near their best. Most people will have spent their entire careers working in organisations over on the left-hand side of the chart. But some lucky few have seen for themselves that the best organisations are indeed much better than the rest. Thus, by “Rightshifting”, we’re talking about the process of moving organisations to the right along the horizontal axis of the above chart. How do you feel about people wasting their time? I’m talking here specifically about the waste of effort, time and resources during the working day. There’s the obvious economic cost, of course. If employees are wasting time, by definition that’s costing their employer money. In software development, both the waste – and the cost – are often significant, but rarely visible. However, I’m not going to dwell on this aspect in this article. Instead I want to talk about the morality of waste. Or rather, the immorality of it all. We’ve already seen how Clifford caused uproar amongst his peers by suggesting that belief is subject to ethical scrutiny. And I’ve suggested that most executives’ belief that things are OK within their software development shops fails that ethical test. But I feel it goes further than that. Not only is executives’ naïve belief in the productivity of their workforce unethical in itself, but the consequences – for individuals, the business and wider society – are immoral too: waste, misery, stress, friction, conflict, disrespect, under- achievement, despondency, profligacy, demoralisation and frustration, to name but a few. So what to do? First, even before looking at the reality of the situation, on the ground, in their own organisations, I would suggest that responsible executives need to take a look at themselves – and their own motivations and culpability. Have they “honestly earned the right to their belief through patient investigation” – or are they merely “stifling their doubts”? Have executives “honestly earned the right to their belief through patient investigation” – or are they merely “stifling their doubts”? If the latter, then I suggest executives are ethically bound to go look for themselves at the reality of the situation in their organisations. Some may feel uncomfortable doing this, lacking the necessary technical skills, or even simply the time. This should be no bar, however. Various specialist organisations exist to offer the necessary audit and review services. These organisations can conduct Clifford’s “patient investigations” and furnish the objective evidence. Having the necessary evidence in mind, executives may then take pride that their beliefs pass the ethical test. Of course, having real evidence to hand will likely show that the business has much work to do to by way of Rightshifting. So then let the journey commence! And finally, executives with a new-found or renewed ethical sentiment may begin to examine their peers’ beliefs in an ethical light, too. Thus, ethical business, and a more ethical society at large, grows stronger. Or is that too much to hope for?